Your feet provide you with the foundations to keep you stable and balanced when standing and walking. When the foundation is not stable it will often affect your posture. 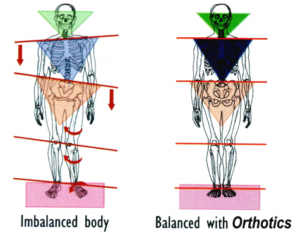 More often than not you will develop instability in the feet, back, hips, knee and ankles. It has been found that individuals that suffer from headaches and migraines could be doing so due to flat feet. While not all individuals who have headaches and migraines will suffer from flat feet, nearly 25 percent of all individuals that suffer from migraines do so due to poor postural issues as a result of muscle tightness for long periods of time. Sometimes signals are sent to the brain as a result of these muscles being overloaded, causing inflammation within the brain to occur resulting in your headache or migraine.